On October 2, 2007, the United Nations first celebrated the International Day of Non-Violence. 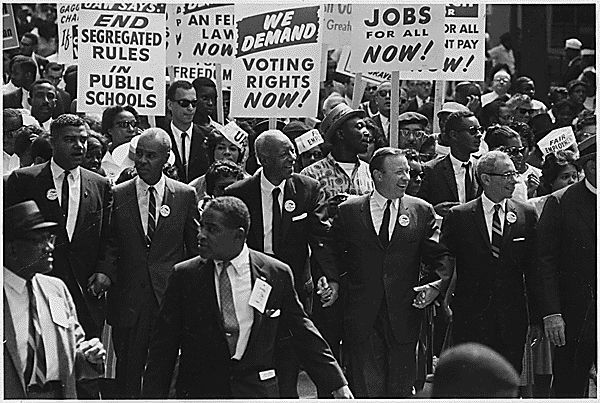 The March on Washington brought together disparate branches of the civil rights movement. Here, leaders of the march walk from the Washington Monument to the Lincoln Memorial, where the day's major speeches were delivered. Front row, from left: Whitney Young, executive director of the National Urban League; Roy Wilkins, executive secretary of the National Association for the Advancement of Colored People; A. Philip Randolph, leading organizer of the march and president of the Brotherhood of Sleeping Car Porters; Walter Reuther, president of the United Auto Workers; and Arnold Aronson, secretary of the Leadership Conference on Civil Rights. On October 2, 2007, the United Nations first celebrated the International Day of Non-Violence. The day was chosen to honor the birthday of Mahatma Gandhi, a pioneering strategist in the philosophy of nonviolence and a leader in India’s independence movement. Nonviolent resistance includes marches, sit-ins, boycotts, demonstrations, and peaceful protests. Gandhi’s influence can be seen in the nonviolent resistance offered by civil rights leaders such as Martin Luther King, Jr., and Cesar Chavez. Leaders in national struggles, such as Nelson Mandela in South Africa and Aung San Suu Kyi in Burma, have also been inspired by Gandhian nonviolence. to stop using or buying a product, or to stop using or buying products at a specific location, usually to make a social or political statement. organized public display of support or criticism for a policy or event. to highly respect or recognize as superior. (Mohandas Karamchand Gandhi, 1869-1948) leader of Indian independence movement. group of people or organizations with a common set of interests and plan for pursuing them. philosophy of rejecting physical force and transforming society through peaceful protest. demonstration where protesters occupy a space and refuse to leave it. expert in careful planning toward a goal (strategy).